With the festive season fast approaching, everyone is seeking holiday entertaining ideas that are both easy and will wow the crowd. John Wm. Macy’s Cheesesticks offers a variety of CheeseSticks and CheeseCrisps that will make it easy to be the hostess with the mostess without evening having to break a sweat. I have reviewed John Wm. Macy’s Cheesesticks as a gift option but now I want to share how they would also be great to have on hand for easy appetizers. 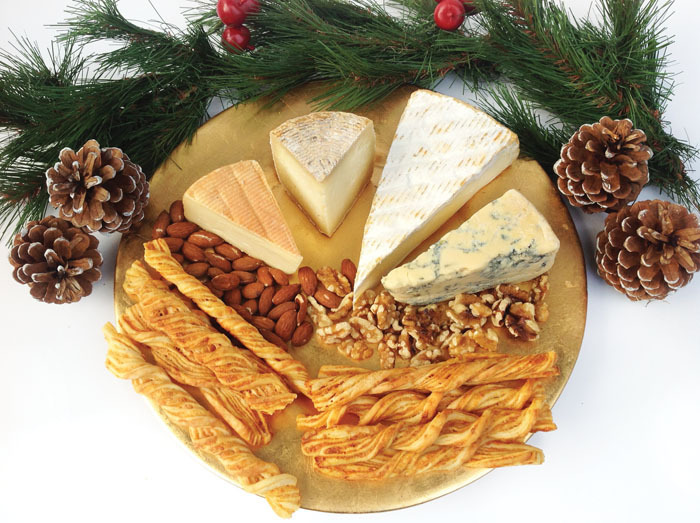 I received photo collection of serving ideas that will prove to be perfect for the wine and cheese party, or as an hors d’oeuvre before the main course: http://macyscheesesticks.tumblr.com. I would never have thought to use these as a serving vessel for a cheese slice. However I decided to put these cheese crisps to the test. 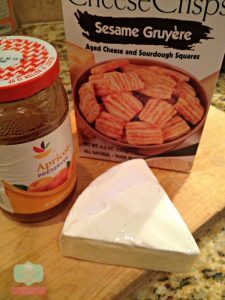 Having a coffee to attend I thought I would make a snack that was both sweet and savory. I could eat Brie all day if it was not so fattening. I recently went to a party that 3 different people brought brie appetizers, you know the ones wrapped in dough. A classic appetizer, well this one is deconstructed slightly. 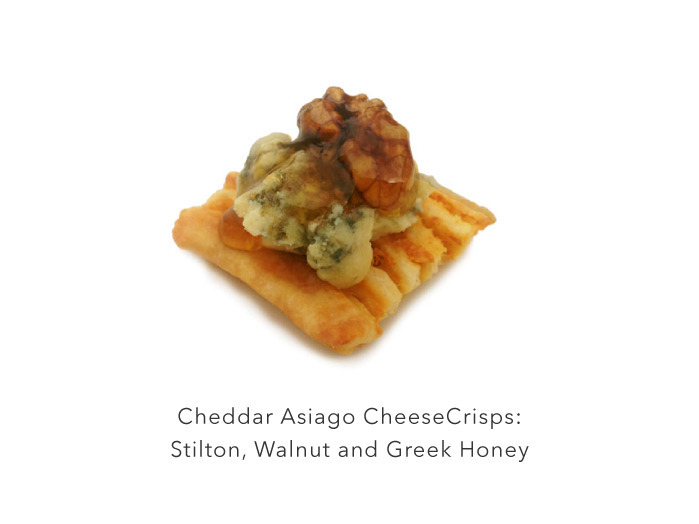 Use Sesame Gruyere CheeseCrisps as your base. 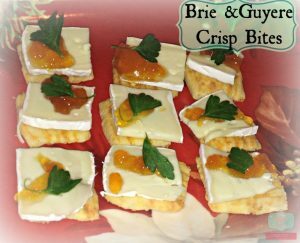 Place a thin slice of Brie on each cheese crisp. I heated some Apricot preserves in the microwave. Dollop a little Apricot on each piece of Brie. 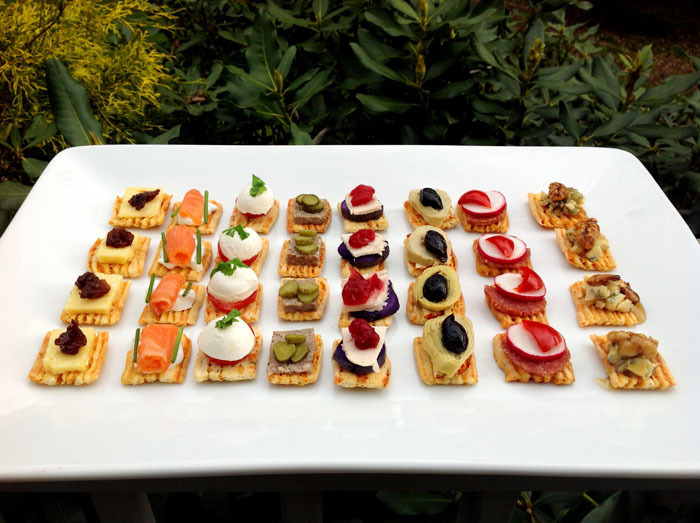 What a elegant but super easy appetizer ideas that can be thrown together in a pinch. John Wm. Macy’s CheeseSticks line includes both savory CheeseStick varieties along with three dessert SweetSticks; here is a full list of flavors. Which easy appetizer idea would you like to try?